19. 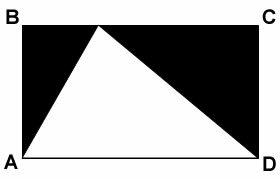 If the area of the rectangle ABCD shown below is 36 square units, how many square units is the area of the shaded region? = 18 sq. units * Ans. 20. This tank holds 48 liters of gasoline and the car averages 5 kilometers per liter. Approximately how many kilometers can a car travel this given guage? The guage indicates that the tank is 1/4 full. Let N - be the number of kilometers that can be traveled. 21. 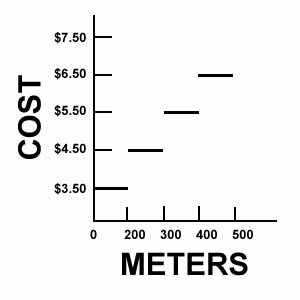 Which of the following graphs represents the taxi rates for a company that charges $ 3.50 for the first 200 meters and $ 1.00 for each additional 100 meters? This is the approximate graph for the taxi rate, there is an abrupt change in the fare for every 100 meters change in the distance. 22. A laboratory assistant was preparing a solution that should have included 40 milligrams of chemical. If he actually used 41.30 milligrams, what was his percentage error (to the nearest 0.01 %)?